DELMHORST EUROPE, Υγρόμετρα, Μετρητής υγρασίας, Μετρητές υγρασίας για έδαφος και ξύλο, στην EUROPAGES. Μετρητές υγρασίας Delmhorst - λύσεις για τον έλεγχο της υγρασίας ! Φορητοί μετρητές υγρασίας επαγγελματικής χρήσης για την μέτρηση της υγρασίας σε ξύλο, υλικά δόμησης, δάπεδα, χόρτο, σπόρους, κόκκους, βαμβάκι, χαρτί, χαρτόνι, δέρμα και πολλά άλλα. Η Delmhorst φημίζεται για τον σχεδιασμό, την ανάπτυξη και την κατασκευή μετρητών υγρασίας ανώτερης ποιότητας που διατίθενται στην αγορά. Δεσμεύεται για την παροχή άριστων προϊόντων και ανώτερη εξυπηρέτηση. Ενισχύστε την εμπειρογνωμοσύνη σας χάρη στις ικανότητες μας στον τομέα της μέτρησης της υγρασίας. The JL-2000 is the perfect quality control and monitoring tool for tanneries everywhere. The moisture content of hides is a crucial factor during all stages of leather processing. 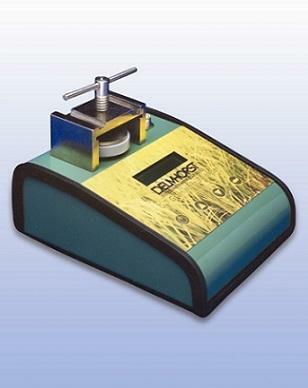 The RDM-3 moisture tester is an accurate and reliable tool for the lumber and woodworking industries. It is ideal for anyone who needs to collect and analyze key statistical information about MC. The F-2000 checks hay moisture in the windrow and in small or big, standard or high density, square or round hay bales, Can be equiped with the 830-X pen electrodes that are up to 90 cm length. BD-2100 is a versatile moisture meter for testing the moisture content on wooden building materials, it also can be used on gypsum, concrete, sheetrock and other construction materials. P-2000 - indispensable tool for moisture check in carton and paper products. 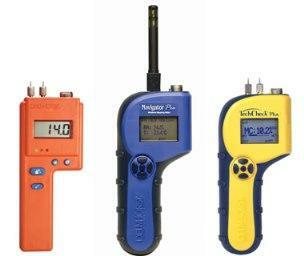 The non-invasive meter uses RF signals to quickly scan wood (specific gravity between .30 and .80), timber, drywall, flooring, veneer , concrete or other building material without damaging the sample. C-2000 – a valuable tool at the ginning process and when buying/selling cotton. This meter can be used for seed cotton, lint cotton, baled cotton, cotton yarn, cotton fabrics, wool, viscose and rayon. It is widely beneficial for farmers, growers, ginners, cotton suppliers etc. It is used for checking floorings, floors, wood, walls and drywall, for scanning concrete, building materials and concrete slab, and for measuring ambient temperature and RH (Dew Point and GPP). This meter is designed to scan and locate moisture levels in floorings, ceilings, building and wood materials as well as in drywall. It is especially useful in restoration works and for inspections.